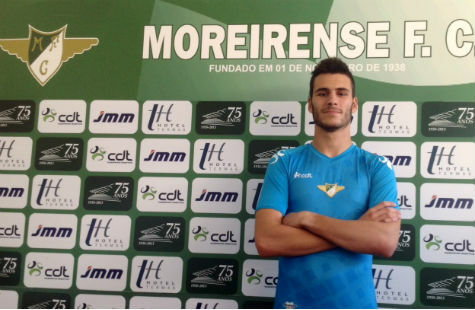 News came today that Portugal U-19 European siver-medalist Andre Moreira had joined Liga side Moreirense on loan from Atletico Madrid. A move for the goalkeeper came as little surprise, as he was playing his club football at lowly third division Ribeirao before impressing for the U-19s this summer. But what came as a surprise was not that he had joined a top-flight side, but instead that he was joining on loan from Spanish giants Atletico Madrid. Moreira enjoyed a very positive Euro U-19 Championship tournament this summer. Despite only playing in the third division leading up to the tournament, Moreira secured the starting position in goal ahead of Tiago Sa, who is a regular for Braga B in the second tier. This alone raised some eyebrows, and it was all the more impressive when one considers that Andre Moreira was one of the younger participants in the team at 18 years old. In the time around the tournament, clubs such as Manchester United, Benfica, Valencia, and Monaco were all interested in Moreira. This comes as no surprise from his solid performances at such a young age. It’s not everyday that an 18 year-old goalkeeper becomes a starter for his club. Around the time that the interest in Moreira was beginning to ramp up, it was announced by his club, Ribeirao, that he his rights had been purchased by Jorge Mendes’ agency, Gestifute. Mendes is the notorious agent who represents players such as Ronaldo, Helder Postiga, David De Gea, and others. He is partially responsible for the transfers of many talented players in the league over the past seasons, and has gained a reputation for earning players big moves. Gestifute bought Andre Moreira for 220,000 euros and apparently negotiated a move to Atletico Madrid. Though I have been unable to find any confirmation that Andre Moreira did indeed end up at Atletico Madrid, all major Portuguese sports news outlets are reporting that he did indeed sign for them. And it’s easy to believe. Mendes has strong ties to the big clubs in both Spain and England. Now, Andre Moreira will join newly-promoted Liga Zon Sagres side Moreirense on loan from Atletico Madrid for the season, a move which will surely give him some playing time. Moreira will have to compete with first-choice Marafona, as well as Ricardo Ribeiro and new signing Gideao.